It's the sapphire foil from Update. Numbered to 25, I jumped at this when it showed up a week back. Think of the mail away foil, only lighter blue (ie - gimmick). Also, with a little help from Dennis at Too Many Verlanders, the cammo and the mini gold are snagged from COMC at a price I am willing to pay, and by "willing to pay", more like find vintage at my LCS and trade in value. 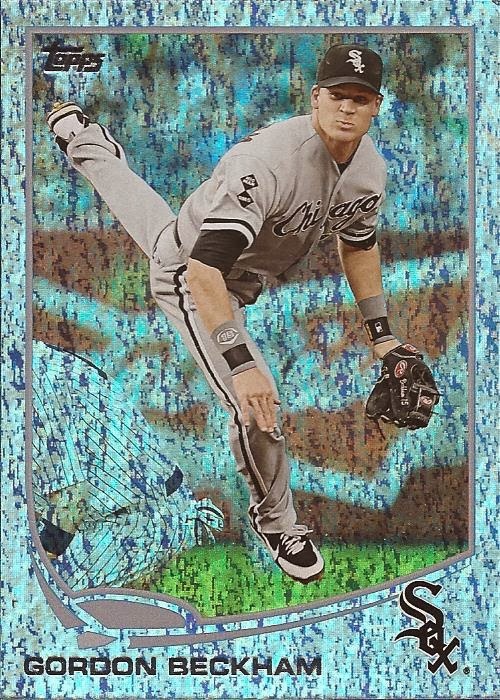 So after that completes, I will be down to 2 "should be able to find" (mini and pink #/50), one "why did I pass up the two chances to snag it of ebay in the past" card (the silver #/10), one "I hope it shows up somewhere (mini black #/5) and then the "gonna be hard to find" 1/1s and plates. If you see anything I would need, reach out to me, would ya?